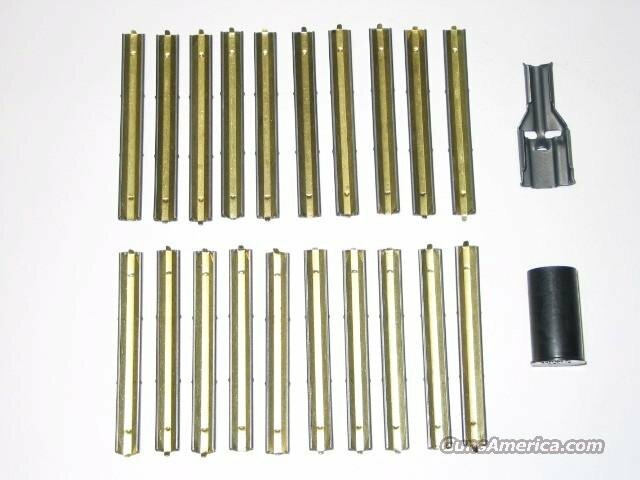 Description: This set contains 20 USGI stripper clips, one new USGI stripper clip guide and 1 new shoot through muzzle cap. The stripper clips hold 10 rounds of .223 ammo, 20 will hold 200rds. This is a much more convenient way to carry large amounts of ammo without having to carry a lot of magazines. Both the stripper clips and the guide are reusable and the mil- spec muzzle cap is an added bonus. It fits your bird cage muzzle brake/flash suppressor and will keep dirt and debris from entering your barrel. It can even be shot through if need be. Gun,magazine and ammo not included. Check out my other items for sale, as I combine shipping.